This Gucci small handbag is perfect for a night out or everyday use. In blue denim GG logo jacquard fabric, with camel brown leather trim and handles. Style number 224093 FQ1G. 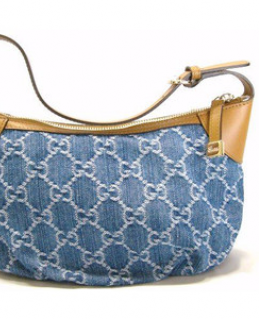 This handbag is an updated classic with blue jean GG logo fabric. It has a convenient adjustable strap and zip-top closure. The hardware is light gold with Gucci inscribed on the tab.